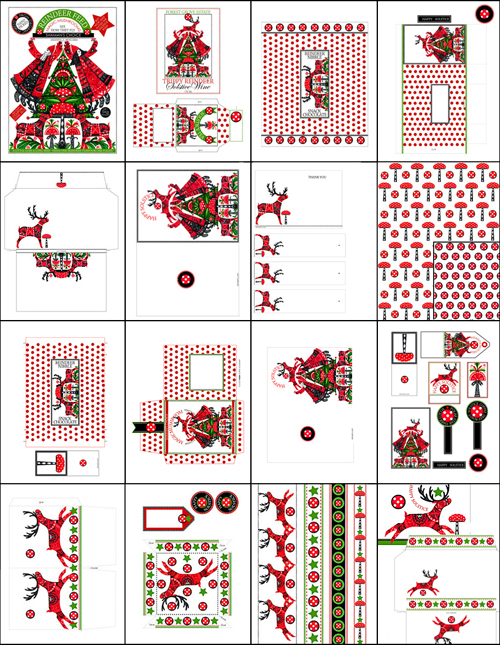 FUN "REINDEER FEED" POSTER INCLUDED FOR WALLS, TO IRON DOWN OR FOR A GIANT CARD! Images of red spotty mushrooms, shamans in folksy gear, a tree of life as a decorative pine tree and happy reindeer were especially illustrated by Anni for this folksy range. The pretty and easy Solstice Crafts loaded with esoteric meaning and lore are for lovers of Solstice in its ancient Nordic form. The dried mushrooms were distributed to the tribe at the winter solstice – through the chimney if doors were snowed up! Reindeer too, love these fly agaric mushrooms – so called because they induce an euphoric feeling of flying rather than for attracting flies. Trippy reindeer have found their way into out Xmas imagery. Printable solstice crafts are a fun way to connect with this old custom without having to go mushroom picking. This huge collection of printables are beautifully pre-designed to make it easy to craft for Solstice greetings, gifts and favors. And there are many tags and labels to personalize the items and add to other wrapped gifts. Pay securely with a CREDIT CARD or your PAYPAL ACCOUNT. You do NOT need a Paypal account to buy. Cards for Greetings and Thanks. • Coordinating set of four papers with dots, stripes and gingham for more crafts. Jan Irvin's Gnostic Media has fabulous, books and podcasts on Shamanism, Mushrooms, Spirituality, Philosophy, Love, Life and the Universe!